iPad: Mailbox, the Gmail app that's made to help you get to inbox zero, is now available for the iPad. Like its iPhone counterpart, it sports a clean design and gesture-based interface that makes flicking through emails easy. 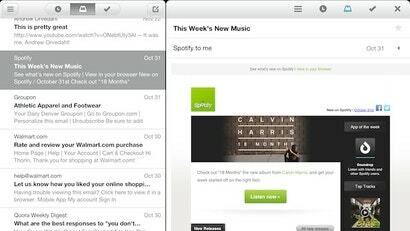 We liked the iPhone version of Mailbox quite a bit, and the iPad app is essentially the same. The big difference is that with the increased screen real estate you now get a reading screen on the right side of the inbox queue. The iPad version of Mailbox features all the same gestures as the iPhone version as well. Swipe right to send an email to the archives, or swipe left to snooze a message for later. You can also swipe all the way to the left to send messages into to-do list folders so you don't lose them, or all the way to right to sent them to the trash. Mailbox still only works with Gmail, but if you're interested in checking it out, it's free and there's no waiting-list this time around.